Fullly fenced - Huge flat sunny front and back section, perfect for children of all ages. Section and house maintain all day sun. Back yard has a swing hanging off a lovely big pine tree, or sit under the front porch at the outdoor table and chairs to watch the kids play on the front lawn. Front porch is fully covered so even nice to sit under if raining. BBQ provided here. Facilities include microwave, dishwasher, oven, fridge/freezer, TV and DVD player. Woodburner and firewood supplied. Kitchen fully stocked with crockery, cutlery, glassware, pots, baking, serving dishes, sandwich press, electric beater. Bathroom has a shower over the bath, vanity, toilet, plus a 2nd toilet off the 3rd bedroom. A range of children toys inside, car ramps and garage, dollshouse books, games, and a large selection of DVDS. Toys in the garage shed include, trikes, scooters, dolls stroller, toy lawnmower, see-saw, tennis and badminton rackets, cricket set and boogie boards. BYO bed linen and towels but pillows, mattress protectors, duvets and covers are provided. Port-A-Cot in bedroom wardrobe. There is a sleepout adjoined to the garage with bunks. Located 200 meters from Foxton Reserve, Duckpond, Huge Playground, 3 Tennis Courts, Skate Park and BMX Track. Another Pirate Playground further down the main road. Short walk to local cafe and ice cream counter, open from 10.00 through to dinner, or use the really popular local fish and chip shop or new cafe down the road. Nice and quiet flat streets for riding bikes, walking, going to feed to the ducks. Estuary, River, Boat Club and Bushwalks nearby - Suitable for boating. Local Four Square has everything, including fresh baked bread each day. Sand dunes 50 metres away - follow the sand dune walking track directly to the beach. 8 Beds to choose from including sleepout, but we allow a maximum of 6 guests. 100 meters walk to playground, tennis courts, BMX track, duckpond and estuary. Huge outdoor area, with sun in the front and shade in the back. Lovely big tree with a swing in the backyard. The house is great for families, very well equipped with lots of DVDS, board games and toys. The dishwasher makes for effortless holidays. 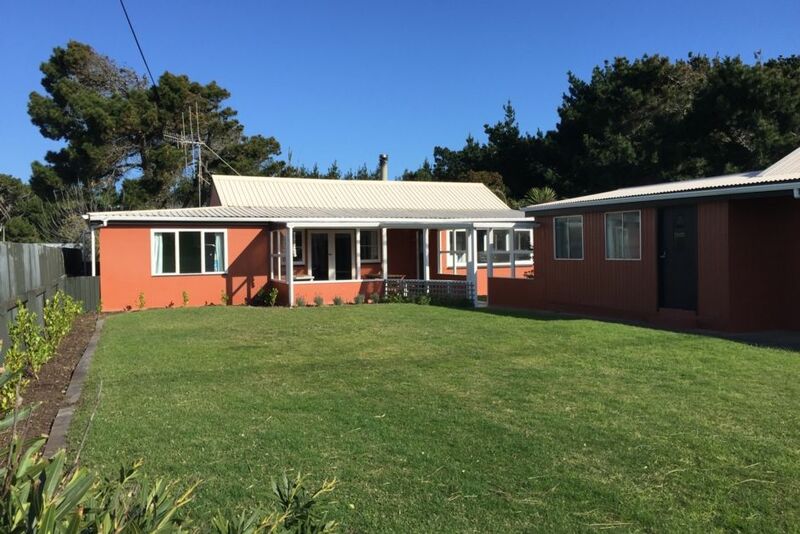 Located in a calm spot (out of the wind), walking distance to the park, beach and cafe. Delightful beach house,very homely feel with comfy beds. Ideal for families with lots of toys, bikes etc to keep the young folk entertained. Short walk to beach & estuary. We will be back, thanks Jeff. The bach was gorgeous and the location fantastic. We had a lovely time. Fantastic stay. Great location. Good selection of toys for the kids and plenty of space to run around. Great house that we really enjoyed. Lovely relaxing spot & the house has everything we needed. The outdoor area was used a lot as it rained during our stay. Nice easy walk to the beach. Will book again.